A handy reference to popular numismatic terms. ANACS - A third party grading and authentication service. At one time owned and operated by the American Numismatic Association (ANA), it is now under commercial ownership. APR - Historical auction prices realized for a coin, or APR. Altered Date - A coin whose date (year of issue, stamped on the coin itself) has been altered post-production -- usually for purposes of changing the date to another to fraudulently make the coin more valuable. Adjustment Marks - File marks made by the mint on a silver or gold planchet to correct its weight. Usually seen on 18th- and early 19th-century coinage. Altered Surfaces - Surfaces that have been changed, usually on purpose, and sometimes with the intention of making the coin appear finer than it actually is. A coin that has suffered mechanical cleaning is a specific example of altered surfaces. Blundered Die - A die containing an error in entry of one or more letters or numeral punches; most often the error is corrected but remains partially visible. BN - Brown. This is a copper coin color designation. Other designations include RB (Red Brown) and RD (Red). Broadstrike - A coin struck outside of the restraining collar. Broadstrikes are oversize in diameter and may show a partial collar strike, known as a "railroad rim". Business Strike - A coin minted for public circulation. Choice Uncirculated - A grade of MS63 or PR63 on the 1-70 coin grading scale. Circulated coins - Coins released to the general public. Also, showing signs of wear through use in commerce. Usually refers to business strikes (see glossary entry). Civil War Token (CWT) - CWTs were a form of emergency currency issued by merchants during the Civil War (1861-1865). 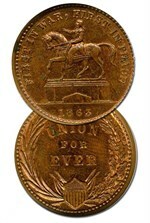 The tokens, struck mostly in copper, were created for commerce because official U.S. denominated currency became virtually impossible to find during the Civil War era due to hoarding. There are two primary types of collectible CWT: Patriotics and Store Cards, the latter acting as a marketing tool for merchants of the times. Clash marks - Marks that occur when two production dies strike each other at normal force without a planchet between them. The result is an impression of the other side of the die on its opposing side, which appears on subsequent coins struck with those "clashed" dies. Clipped planchet - A Mint-caused coin error when a piece of the planchet is missing, unsually from improper cutting of the planchets from the original sheet of metal. Collar - The steel ring that surrounds the coining chamber between obverse and reverse dies. Modern coins are struck within a "close" collar in which the expanding edge of the planchet is forcefully restrained against the collar’s inner surface. Buffalo Nickels were coined within a "plain", close collar, and they have no design on their edges. Condition Census - A term generally used to suggest that a particular coin is one of the finest six examples known to exist of the same date, mintmark and die variety. Cud - A lump (raised area) on the rim of a coin struck from a die where a piece has broken off. The image to the right depicts a Washington quarter with a strong obverse die cud. D-Mint - Mintmark used to denote either the Denver or Dahlonega mint facilities. DDO - Doubled-die obverse or reverse. When a working die is not accurately in register between multiple impressions from a working hub, a slight doubling or shifting of the image is imparted to the die. This doubling then appears on all coins struck from that die. DDR - Doubled-die reverse. When a working die is not accurately in register between multiple impressions from a working hub, a slight doubling or shifting of the image is imparted to the die. This doubling then appears on all coins struck from that die. DMPL - Deep Mirror Prooflike. This designation denotes the reflectivity of the depth of a coin's fields. PL (Prooflike) is designation given to lesser reflective examples. Die - The tool that stamps a design into a planchet. So that the devices and inscriptions will be in relief and readable, the die is infused. Die state - A stage in the life of a die from new to worn, clashed, cracked, chipped, rusted or broken. Doily holder - A special paper insert with a florette background that PCGS used for a short period of time that fans have affectionately termed the "Doily Holder". Doubled die - When a working die is not accurate in register between multiple impressions from a working hub, a slight doubling or shifting of the image is imparted to the die. This doubling then appears on all coins struck from that die. See DDO/DDR entry. Error - A mint-caused mistake that results in a coin being produced improperly. Depending on severity and rarity, an error often adds value to a coin rather than detracts. NGC Fatty - A type of holder design used to slab coins in the first decade of NGC's inception (approx. 1986-1996). These holders are noticeably thicker than current holders and are seen with various label styles, including the earliest variants which lack a barcode. FBL - Full Bell Lines. The horizontal lines seen banding the Liberty Bell on the reverse of Franklin half dollars. Gem Uncirculated / Gem Proof - A grade of MS65 / PR65 or higher on the 1-70 coin grading scale. Gold CAC sticker - CAC awards a Gold Sticker to coins they believe to be ungraded by a full point, or more. Hub - A steel cylinder that on one end bears a positive or relief image of a coin design. A master hub is used to sink master dies, while working hubs are used to sink working dies. Incuse - Letters or devices sunk below the coin’s surface. LSCC - Liberty Seated Collectors Club. Founded in 1973 as a nonprofit organization to encourage, promote and dispense numismatic knowledge of Liberty Seated Coins. Publishes the Gobrecht Journal on a quarterly basis and a collective volume every five years. Mechanical Doubling - Occurs when one or both dies move laterally or rotate slightly at the moment of striking. The result is a shallow doubled image on devices and/or lettering. This kind of doubling is flat and shelf-like, rather than showing the contoured doubling typical of a doubled-die variety. Such coins are not considered varieties and have no added value. Also called "shelf" doubling. Mintmark - Letter or symbol identifying the mint of origin of a coin. On federal coins, mint marks are normally punched by hand into each working die at the Philadelphia Mint. Mule - Producing a coin by combining two dies not meant to be together. Obverse - The heads side of a coin. OGH - OGH stands for Old Green Holder. PCGS used a green label tag in their 1st and 2nd generation holders before switching to the current blue insert. Original roll - Coins are delivered to the Federal Reserve Banks from the mint in bags or boxes, never in rolls. Thus, uncirculated rolls are wrapped by banks from freshly delivered coins. "Original" rolls consist of coins that have been kept together since new and have not been picked through by collectors who then substituted lesser coins for the finer pieces. Overdate - A variety in which at least one digit of a date has been changed either for mint economy or to correct a blunder. Pattern - Proposed coin design not adopted. Often comes in metals other than those proposed, such as copper or aluminum. Piece de Caprice - A coin designed on a whim or to create a rarity, not out of any urgency for a circulating medium. Examples include the 1859 and 1860 Half Dimes without UNITED STATES OF AMERICA. Plain edge - The lack of reeding is referred to as a "plain edge". Proof - A specially minted coin normally given two or more blows from the dies to bring up the designs more sharply than on production coins. Typically minted on burnished blanks from burnished dies. Prooflike - Struck from brilliantly polished dies on a blank which may or may not also have been polished before striking. Punch - Tool for impressing a design element into a die. RB - Red Brown. This is a copper coin color designation. Other designations include BN (Brown) and RD (Red). RD - Red. This is a copper coin color designation. Other designations include BN (Brown) and RB (Red Brown). Reeding - Lettering or marks around the edge of a coin. Reverse - The tails side of a coin. RPD - Repunched Date. A date that shows signs of earlier numerals underneath, indicating that the date was punched in more than once. RPM - Repunched Mintmark. The mintmark has been punched into the die twice, resulting in a doubled mintmark on the coin. Since the doubling appears on the die itself, identical specimens are produced and the variety is considered collectable. S mint - San Francisco Mint. Shelf Doubling - Also called machine doubling or ejection doubling. Refers to doubled mintmarks and other details of the coin caused by a torsion between the two dies during ejection of the planchet. The doubled detail looks like a thin shelf attached to the mintmark or whatever detail of the coin that appears to be doubled. Slider - Current slang for a coin that is about uncirculated (AU) but is close to and possibly sellable as mint state, particularly after cleaning and recoloring. Synonymous with the AU58 grade. Sutler - Refers to the issuer of Civil War tokens who followed Union troops from battle to battle and issued tokens as a method for the soldiers to use in barter. Transitional - A design adopted in a subsequent year, or a design of which one side is current, the other later adopted, though the combination may not appear on later production coins. Uncirculated - A coin that has never been in circulation nor received wear as such. Coins are graded on a 1-70 scale, and any uncirculated coin will grade 60 or higher. See "Choice Uncirculated" and "Gem Uncirculated". Variety - Any coin that is recognizably different in dies from another of the same design, type, date and mint.